Have you heard about Helen's antique scene? 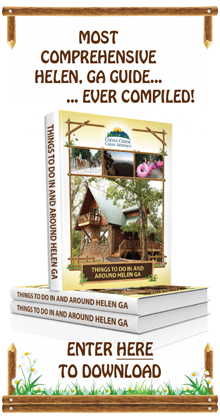 Nacoochee Village is one of the most quaint and charming areas of Helen, and is walking distance from the downtown area. Amongst the other Helen business venues located here, you'll find Nacoochee Antiques (sometimes known as the Nacoochee Antique Mall) - an expansive shop inside of the historic Martin house that is almost equally as interesting as the treasures within. As you wander the 3 floors of the shop, you'll come across countless unexpected items - perhaps something that you remember from childhood or have been trying to track down for years! There's always something new to see while visiting Nacoochee Antiques. You'll find that it's next to impossible to walk out empty handed. Situated just a few miles from downtown Helen, Cleveland, Georgia is another hot spot for antiquing. Mountain Laurel Antique Mall is a shopper's delight, as it offers visitors more than 8,000 square feet of antiques, collectables, and consignment furniture. As you browse through the nearly infinite collection of books, art, kitchenware, glass, crystal, dinnerware, and uniques, you might stumble upon an incredible gift for that someone in your life who tends to be so difficult to shop for, or an item that will bring your mother or grandmother back to yesteryear. Plan to make a day of it, as you're sure to get lost in time during your trip! Old School House Antiques isn't just a name - it really is a historic schoolhouse! What started off in the early 1950s as Eastside Elementary School has now been repurposed into a spectacular (and enormous!) shop for all those who are interested in antiques, collectables, memorabilia and more! Shopping here is quite an experience. In addition to enjoying all of the items that fill the inside of the space, but you'll also be able to take in some truly incredible mountain views, as the school house is situated between Cleveland and Dahlonega. As you stroll the wide aisles of the antique mall, you'll really feel that you've been transported back to a simpler time, as oldies music plays in the background. It's an experience like no other. Velvet's Vintage is an adorable shop for antiques, unique and crafty gifts, home decor, and more. Both the beautiful cottage and adjacent shop lay in the majestic shadow of Mount Yonah, and are filled with delights and surprises for people of all ages and backgrounds. 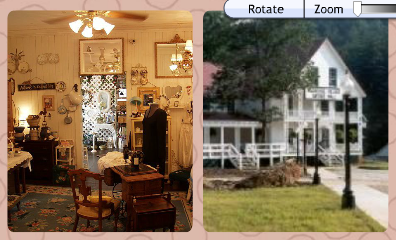 Here, you will find elegant, "prim & proper" home decor and items mixed in with rustic furnishings and memorabilia. This collection of "organized chaos" will get the wheels turning in your brain and spark your creativity, allowing you to dream up new and interesting ways to decorate and furnish your home. You may also discover some gems to wrap up as birthday and holiday gifts for your family and friends. 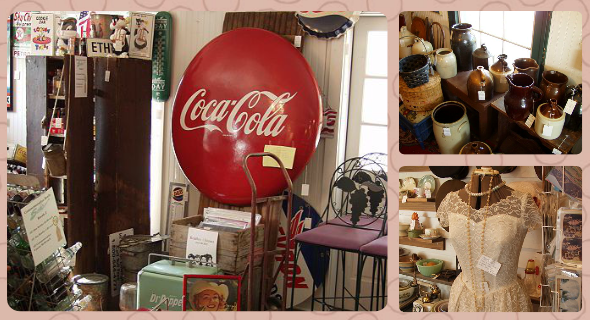 The historic city of Dahlonega, Georgia works to keep the past alive with Gateway Antique & Consignment Mall. This large antique shop is filled with valuable antiques, collectables, and vintage items ranging from jewelry to furniture and just about everything in between. Over 35 different merchants contribute to the mix of exciting and unique items, ensuring that there's always something new and interesting for you to check out. The most recent addition to the mall is a consignment area that has been aptly named, 'Gateway Trading Company'. This eclectic variety of both vintage and contemporary items adds even more to the wide variety of treasures to be found within the mall's walls. With a selection of Helen business places like these, you're sure to find some incredible treasures as you go antiquing during your trip. Have you ever visited one of these superior antique shops? What was your favorite purchase? Feel free to share your success stories in the comments section!